*Received for an honest opinion from Historical Fiction Virtual Tour and the author. I’ve been incredibly lucky to read so many excellent books lately and “Sebastian’s Way” by George Steger was no exception. I loved many different elements of this book. One, I thought the author wrote beautifully. I usually don’t comment on the writing style or technique of an author because I am not a writer. I always look at a book from a reader’s perspective and give my viewpoint from that perspective. However, this author really weaved a beautiful tale about this young man that becomes a soldier during Charlemagne’s time. I think the last time I read about Charlemagne was when I was in fourth grade so much of the information was very new to me. Steger made it easy to get lost in this world of bitter battles and Sebastian’s coming of age. It was very easy to love Sebastian and empathize for his struggles as he tries to prove himself. I thought the author presented a very diverse point of view. He explained how the conquests and fighting affected everyone, he made Sebastian a hero but still fallible. There are many action scenes but they were entertaining, intriguing and informative. I’m embarrassed to say that much of the history regarding the Frankish-Saxon wars was new for me but it flowed easily with the story so it did not feel overwhelming. It was easy to become enraptured in the story and to root for this hero as he proved himself and fought many difficult battles for his king. If you’re looking for adventure, struggle and coming of age with the backdrop of history, you can’t go wrong with this wonderful story. Usually I don’t read too many paranormal stories because I find that I have a difficult time identifying with the characters. I was really intrigued by this story because of the backstory of Jack the Ripper. Even though it’s a horrid historical occurrence the mysterious identity of who he was continues to intrigue. There are many different aspects of this story that are engaging. I was also interested to learn about Piper Smith and Sergeant Samuel Hawkins. The story begins with the murder of a woman of the night. Immediately we are told that it’s Jack the Ripper who is responsible because he leaves a note. This is a dark story and there are some difficult scenes to read. I struggled at first to understand the main characters and there were so many layers behind these characters that they provided as much of a mystery as Jack the Ripper. There are a lot of characters and they all play a very interesting role. I enjoyed that all the characters were relevant to the story and interesting. It became like putting the pieces of a puzzle together. Piper Smith and Sergeant Samuel Hawkins bring many interesting aspects to the story in both the present and in the past. At first we know that Piper and Samuel grew up together but Samuel “abandons” Piper. This is a big issue between them and even though they share a very strong history in the present day they are practically strangers. Piper is trying to prove herself as an archivist. She has a machine that grabs the memories of the murder women. As an archivists the memories become hers. Since they can be a very scary to hold on to all those memories, Piper goes through a memory erasing exercise. Some memories she still wants to keep. Although Piper and Samuel share an intense history there is always friction between them. They are on opposite sides. Samuel, once a part of the Archivists' Guild with Piper, left with no explanation. Samuel is now a Sergeant at the King’s Sentry. This conflict becomes a major part of the story as it unravels. The feelings that Samuel has for Piper are evident but he keeps resisting them and trying to protect her. Samuel is your typical tortured, handsome alpha male. This story is really a mixture of everything: science fiction, murder mystery and romance. It really has a little of everything but it mixes well. Sci-Fi readers will easily love this story since there are so many wonderful scenes (and gadgets) filled with imagination. Overall, I enjoyed the story, even though there were parts that I struggled through. Piper and Samuel made the story a great read for me, I wanted them to come to terms with their past and gain perspective on their future. I also really loved how Piper evolved from a shy and fragile young girl to a strong and in control woman. As Samuel and Piper are forced to work together they have to learn to trust. But the question becomes who they can trust. From the first memory extraction, Piper discovers clues that the murder might be an Archivist. She follows her instinct and keeps the information from her mentor Master Ryerson. Master Ryerson and Samuel definitely don’t like each other, and the reasons become evident. This was a very intense and intriguing read. 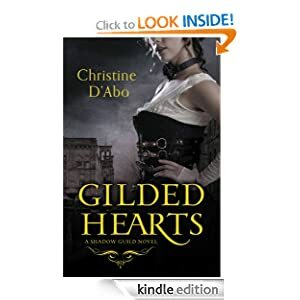 This was my first read by Christina d’Abo but I look forward to reading more especially the next addition to The Shadow Guild. I really enjoy Regency Romances so “An Untitled Lady” by Nicky Penttila was an easy win for me. Having said that I thought Ms. Penttila really presented an amazing story. She blended romance, history and intrigue perfectly not giving too much attention to any one of these elements and making them all work well together. Most of the novels that I have read have taken place in London or around it was refreshing to read about Manchester. It was heart-breaking to read about Madeline Wetherby or Maddie as she is known. Nash Quinn was also very interesting. As the second born son he basically is not of any use unless something happens to his brother. He was industrious enough to join the navy and become a very successful merchant. Although I don’t know much about the Industrial Revolution in England I thought that the author provided enough information to give the readers insight to what a struggle it was for the working class and what it meant to them! I thought that the author really provided emotional integrity to the struggles of the mill workers. The author also portrayed the reality that most women faced if they were not born into high society and did not marry well. On the emotional side, Deacon (the earl and Maddie’s original intended husband) was not the most likeable character and seemed to reflect many of the stereotypes of the higher class. Nash and Maddie have a lot to come up against. They have to learn to be married and when they finally come to terms with their feelings their love for each other is once again tested. The twist that followed Maddie was very clever and I thought the author was very brilliant for mixing the “secret” into the story. It was heartbreaking to see how Nash and Maddie’s relationship became impacted by the social movements of the time. I thought this was very clever of the author as well. I highly recommend this story, it is an emotional ride throughout history with two very strong characters and an equally strong historical background. This was the first novel I have read by Nicky Penttila but it won’t be the last.